To increase the crispness of radish, soak them in iced water for a couple of hours. Wash, then chop off the greens, then slice off the root. Leave whole, slice or chop, as required. Store in a perforated bag in the fridge for around 3-4 days. Always trim the leaves off before storing, as they’ll draw moisture from the radish itself. You can keep the radish greens in the fridge, wrapped in moist kitchen paper then stowed in a perforated bag, for a couple of days. You can also find black radishes, popular in eastern Europe, which are more strongly flavoured, as well as large white mooli or diakon radishes, which are shaped like carrots. They are popular in Asian cookery and have a very mild flavour. 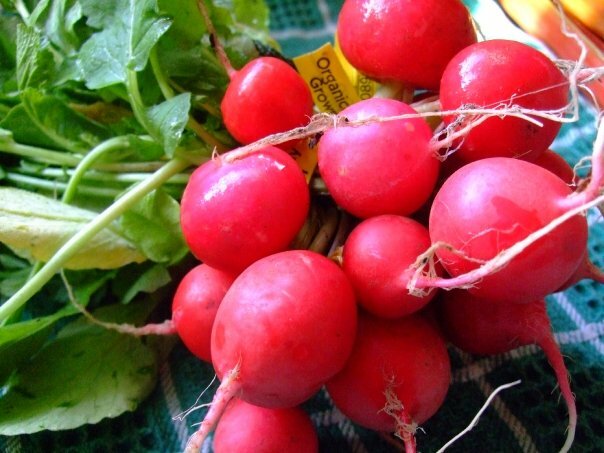 Radishes are rich is folic acid and potassium and are a good source of vitamin B6, magnesium, riboflavin, and calcium. Always prepare radishes just before using, as they loose their potency when cut. Mooli or daikon radishes can be sliced, diced or grated. Mix all but shredded lettuce together and put between slices of your favourite bread or bun, toasted or not, with a mound of shredded lettuce. Cut large radishes in half; leave small ones whole. In a 12-inch skillet, combine radishes, butter, sugar, vinegar, 1 teaspoon salt, 1/4 teaspoon pepper, and 1 1/2 cups water. Bring to a boil over high heat; cook, stirring occasionally, until liquid has reduced and radishes are tender and glazed, 10 to 15 minutes. Serve. Preheat oven to 350 degrees. Using 2 tablespoons oil, brush insides of pita rounds. Cut each round into 6 wedges. Arrange wedges in a single layer on a baking sheet, oiled sides up; toast until golden brown and crisp, 7 to 10 minutes. Meanwhile, pulse feta, yogurt, lemon juice, and remaining 3 tablespoons oil in a food processor just until mixture is thick and spreadable, about 10 pulses. Transfer to a medium bowl, and stir in parsley and radishes. Serve with pita crisps. This entry was posted in Uncategorized and tagged Dips, Radish, Sumptuous Salads. Bookmark the permalink.